In the top half of the screen you have the synthesizer settings. There are four sections: OSC1, FIL1, OSC2 and FIL2. 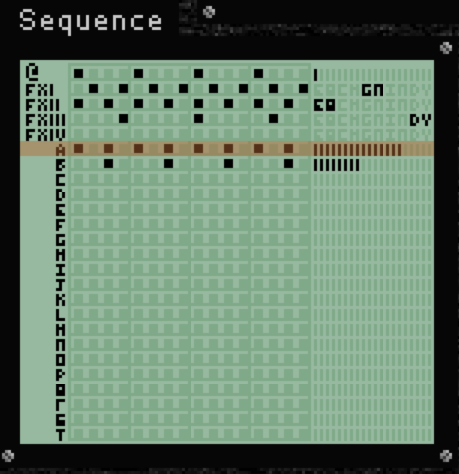 OSC1 is the player’s oscillator. It is modified by FIL1. OSC2 is the oscillator used by your enemies. It is modified by FIL2. The first thing you can see in the OSC section is a little 9×9 LCD display. It shows a wave, undulating up and down. At the side you can see the scale: -4 to +4. Time goes across from left to right: the important part of the wave is the leftmost column: it shows what your next attack will be like (in osc1) or the enemies next attack (in osc2). Positive values translate into damage to the enemy; negative values into damage to yourself. Therefore if the value at the leftmost position of the wave display in osc1 is +3 and you press the key to bump into a monster, they will take 3 damage (although effects can change that but more on those later). If the leftmost value is 0, nothing will happen, while if the leftmost value is say -2, you will take 2 points of damage yourself, again, subject to any effects that may apply. As time moves on the wave will scroll from the right to the left, so you can see to a certain extent what your attacks will be like in the future and plan accordingly. Now that you hopefully understand the wave display a little better let us turn to the various knobs that control the settings of the synthesizer. You can’t control these knobs manually by clicking on them: they are changed when you or an enemy walks over a patch. The patches are blue in colour and say things like “FIL LP” or “PW +”. If you mouse over them they will display a brief description of what they do. When these knobs change their positions they will immediately update the wave display. You won’t always notice a change because of how things work. Wave knob: values: triangle, sawtooth, pulse wave, noise. This selects the type of the wave. You can google the types of wave if you are new to waveforms. Amplitude knob: ranges from 0 to 4. This changes the height of the wave. It also changes the period of the triangle and sawtooth waves (horizontal width of the repeating part of the waveform). With more amplitude you will have higher highs but lower lows and it will affect the timing of the sawtooth and triangle waves. Experiment and have fun! Pulse width knob: ranges from 1 to 5. This controls the width of the waveform when it is set to pulse width. The cutoff knob tunes the filter, i.e. selects exactly how much of the low or high to filter. At setting 4 the filter basically does nothing as it allows everything through, so it’s the same as if the filter type was set to off. At setting 0 on the other hand the filter filters a lot! If set to to high pass, cutoff 0 will remove all values below 0, so it’s hard to hurt yourself! If set to low pass, cutoff 0 will remove all value ABOVE 0, wiping out your ability to damage the enemy! At the bottom left of the screen we have the playfield: 8×8, non-scrolling map. No FOV, no lighting. There are various “effects” which show as coloured squares on the floor. These move around. You can see their direction of travel indicated by a little arrow. If you mouse over the effect you can see a brief description of what it does. You or the mob needs to be standing on the effect at the time when you attack forit to take effect. There are six types of glitch (mobs basically). If you mouse over them in the play area you will see their name and their amount of HP left. Also if you mouse over a glitch or effect you will see a line highlight on the timegrid to the right. The blue things that say things like “PW+” are patches that will affect the synthesizer settings. You can mouse over them for a brief description. Orange hatched square is wall. Indestructible. 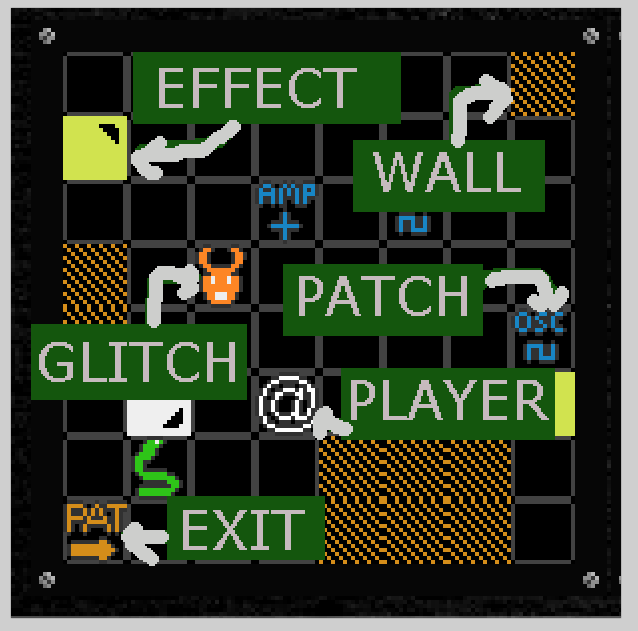 This changes the current pattern (level) so it’s kind of like an exit! Mobs can wipe out the exit. Hahahah. You are doomed. Not really. You can generate another one by killing all the mobs. And let’s face it you were going to do that anyway, weren’t you? Some types of glitch may be able to bring additional gameplay elements into play. I’m sure you’ll figure them out. To the right of the playfield is a readout showing which pattern you are on (basically level). Every four patterns the synth settings will reset to default. This is basically to combat boring situations in which you have the perfect setting set up. There is no actual end to the game by the way: the aim is to get as far as you can. The number of mobs will increase with level up to a maximum amount. Master volume is the player’s hp. What a crazy conceit, no!? It’s a synth so the master volume is your hp! Craaaaazy. The timegrid is like a step sequencer for the game. Going down from the top we have a row for the player, then four rows relating to the effects then up to twenty rows dedicated to glitches. In each row time proceeds from now to the future, from left to right. Each little square is one beat, or micro turn. If an entity has a full square in that beat column they will have a chance to act. A little filled box in the leftmost column means the entity can act this beat. So one beat is a micro turn, and all activity within one beat is considered to happen simultaneously. The game actually looks from top to bottow, so it says, can the player act this beat? if so wait for him to act; next see if each effect can act and do it, then see if any of the glitches (mobs) can act, and do them in order from top to bottom. It is only at the end of the beat that the game looks to see who is alive and who is dead, so it’s perfectly possible to be taken below 0 HP during a turn and not die. 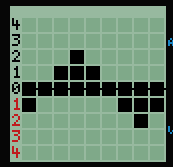 Also shown on the timegrid, to the right is the hp for player and mobs. For effects it shows instead a small indicator to show what effect it is. The player typically acts once every four beats, but in order to be able to attack when conditions are favourable (e.g. when you are standing on a good effect or when your taveform is at its height) the ‘skip beat’ key is your friend. The default binding is numberpad 5. Note that unlike a wait command in normal roguelikes, the skip button will only skip one beat, rescheduling your future beats to be in sync. For example, say the turns looked like: player yes no no no yes no no no… and then you hit skip it will still say yes no no no yes no no no, but you will be shifted one beat to the right. Glitches (mobs) all have set beat intervals, e.g. fast small fighters act every 2 beats and slow ones take longer than the player’s 4. When a glitch spawns normally its sync is set randomly within its beat period, so for example a 1 in 4 acting enemy could, from the start of the game go act no no no or it could go no act no no no act … etc. The current beat number is show just above the timegrid. It’s not that much use except to remind you how long you have been on the current pattern (level). The Event log to the right is often useful to see what just happened. The final interface element, situated to the right of the playfield is moop. moop carry crate for you, yes? If playing standalone version of the game you can redefine the keys from the unity launcher. numpad 2 4 6 8 to move up, down, left and right. Numpad 5 skips a beat. Space starts the game from title screen or goes back to title screen from game over. You can also click left mouse. If you are playing the web player version then unfortunately you can’t change the keys from the default. 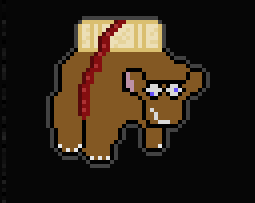 Sorry about that and I will change it if I can “legally” do so to the 7drl version. If not then you have to buy New Key DLC. Resolution will always be 1280×720, sorry. I got flustered trying to change that at the last minute. The engine runs at 640×360 and 1920×1080 too but I couldn’t get the smaller res into the unity resolution list, and I couldn’t pick up the res the player selects from the launcher. What does work in the standalone version is selecting fullscreen or windowed from the launcher. The game will respect that.